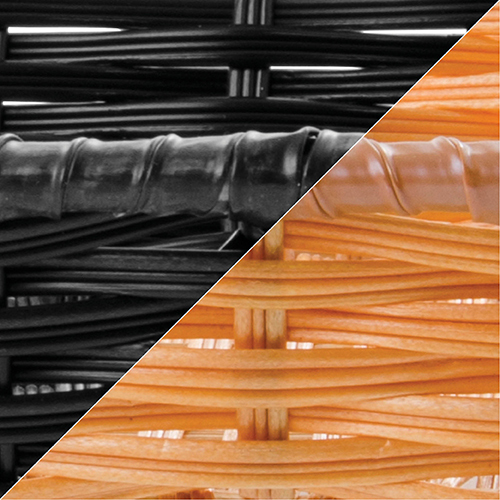 How are you reaching out to your tiniest customers? 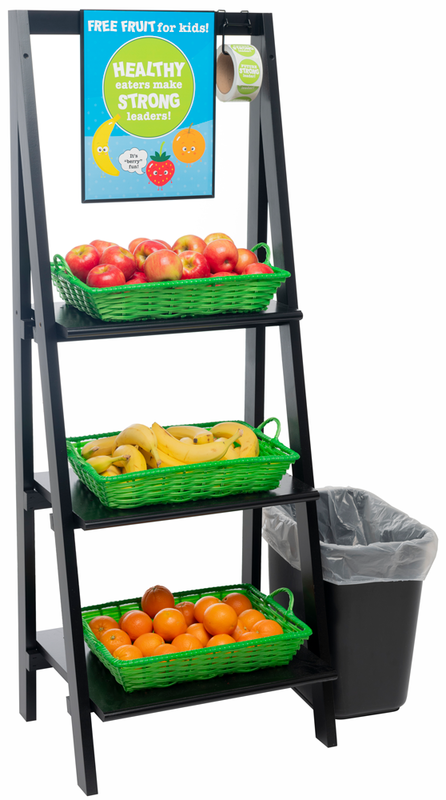 Full Free Fruit Program Solution shown with included green baskets (also available in tan and black), sign and sign holder, as well as optional stickers, sticker holder and waste basket. Everyone knows that happy kids equate to happy parents, and that can correlate to increased sales. However, shopping with kids can be difficult. A chore few moms relish and often try to keep as short as possible. To address this issue, many grocers have enhanced the shopping experience for parents by implementing a free fruit program into their store. Kids ages 12 and under can pick out a free piece of fruit to take with them while their parents shop. In doing so, they have found that customers are less rushed and more likely to enjoy grocery shopping. As a result, families who participate in the free fruit program tend to stay in the store for a longer period of time–which means more time spent in the aisles and a fuller basket or cart. As an added bonus, when food retailers show an understanding and sensitivity to family needs, parents are likely to return more often. Approximately 1 in 5 school-aged kids are obese, according to the Centers for Disease Control. 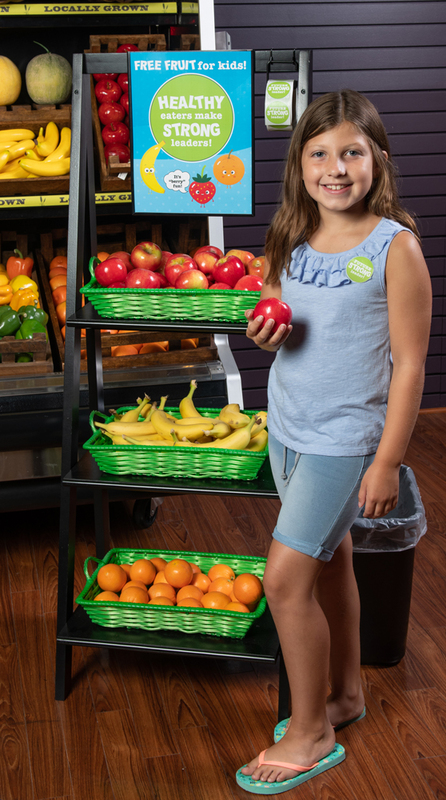 Stores are doing their part to fight childhood obesity and promote healthy eating by offering free fruit programs designed to help children reach one of two servings of fruit each day, which is recommended by the United States Department of Agriculture. It's never too early to begin teaching kids about the importance of nutrition. Free fruit programs help shape their preferences and attitudes toward nutritious foods by offering easy healthy snack options. It's also a great way to introduce school-aged children to a variety of fruits that they otherwise might not have the opportunity to sample in the hopes that they will become excited about eating more fruit. When children learn healthy eating habits at an early age, they're on a path to good health for the rest of their lives. 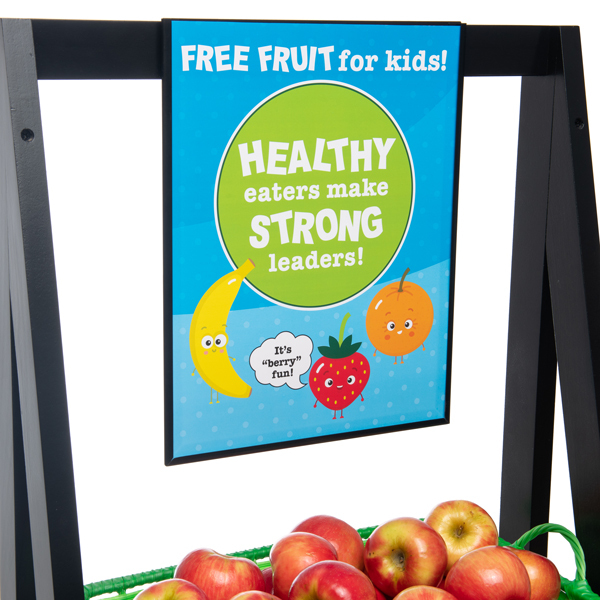 We have a simple and inexpensive merchandising solution that will draw attention to your free fruit program and give your little visitors a sense of excitement and fun. Check out our kids fruit stand complete with fun graphics and stickers! Complete kit with green baskets, optional sticker, sticker holder, and waste basket. 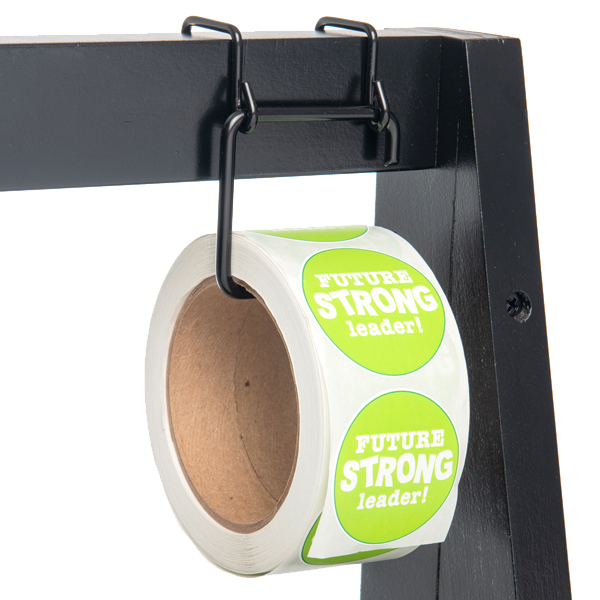 Optional sticker holder and sticker roll. Colorful sign and sign holder included in kit. Need help implementing a free fruit program in your store? Contact our market experts today at FoodRetail@hubert.ca or call us at 1.888.835.7929 so we can discuss a personalized solution for your store.